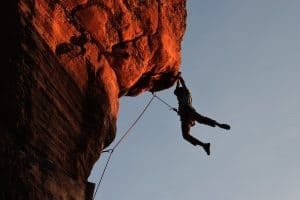 Whether you’re a novice climber or a seasoned rock wrangler, a solid pair of climbing shoes can make a serious difference in your performance. 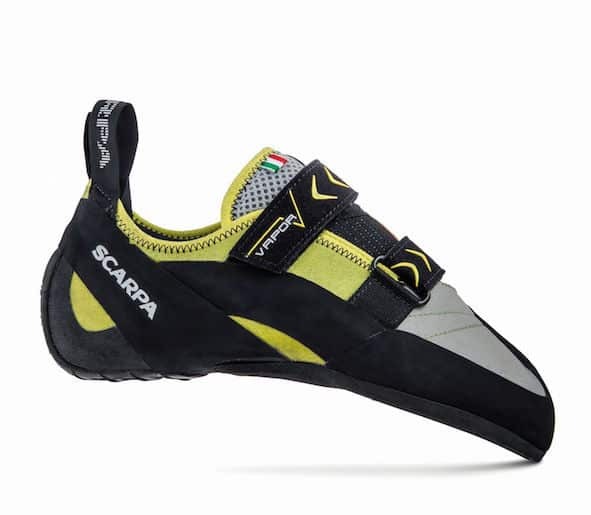 A good pair of shoes that fits well and is designed for the type of climbing you do can be the difference between a send and a disappointing fall on your project. However, there are so many different climbing shoes available today that it can be difficult to find one that’s just right for your needs. To help you out, we’ve created this climbing shoe buying guide to help you decide what pair will work best for you. If you're short on time, be sure to check out our top pick, the awesome Anasazi Pinks. There are a number of different features to consider when buying climbing shoes. Here, we’ll focus on the two most important features - shoe and closure type - to help you decide what pair might be right for your needs. Modern climbing shoes come in three basic types: neutral, moderate, and aggressive. These types refer to the fit of the shoe and can have a drastic effect on your ability to balance on small holds in the upper grades. Neutral shoes are often the most comfortable and are recommended for newer climbers. They allow your toes to lie flat and can be great for slotting into cracks. 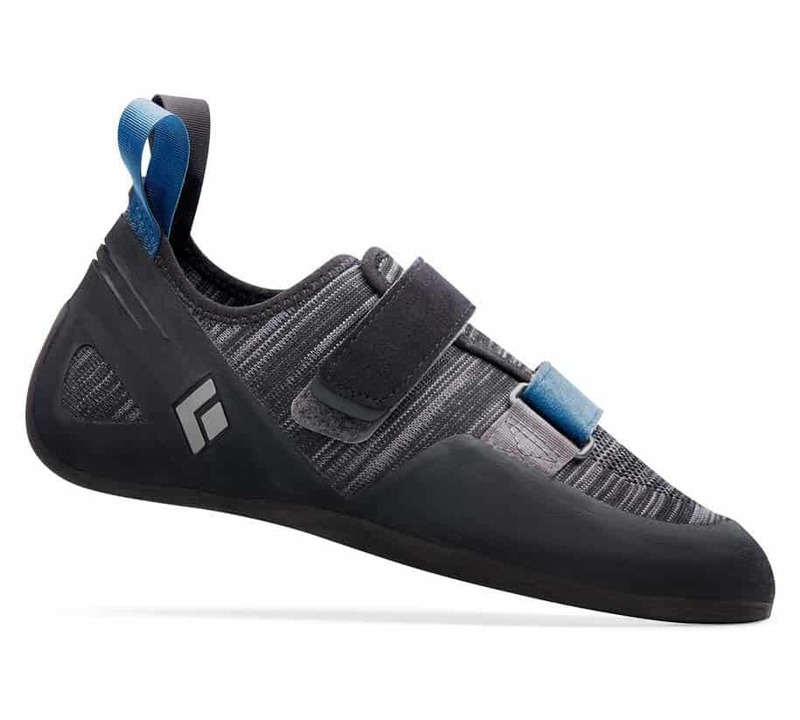 Moderate shoes have an ever so slight downturned shape (called camber) which is great for technical climbing. These shoes put your feet into a more powerful position, but that comes with a slight decrease in comfort. Thus, they are recommended for intermediate climbers and people who spend most of their time on moderate overhangs, slabs, and crack climbs. Finally, aggressive shoes have a large downturned shape and lots of heel tension to put your foot in the most ideal, powerful position. This shape is best for very overhanging sport climbs or challenging bouldering problems. They tend to be the least comfortable of all climbing shoes, however, and their thinner soles tend to wear out faster. But, if you need a shoe for your super hard roof project, you might prefer an aggressive pair. Climbing shoes tend to come with one of three closure types: slippers, velcro, or lace-up. Slippers are easy to take on and off and are ideal for gym climbing or bouldering. They are the most sensitive to the rock underfoot and tend to be the most comfortable. 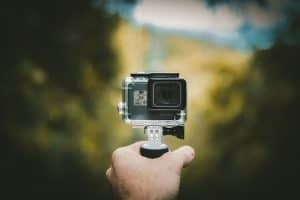 Unfortunately, this all comes with a decrease in performance as they don't wrap as tightly around your foot as most people would like. Velcro shoes maintain a lot of the convenience of the slipper with the added benefit of being able to tighten and adjust them. This allows you to pop them on and off as much as you'd like but still maintain a snug, powerful fit. 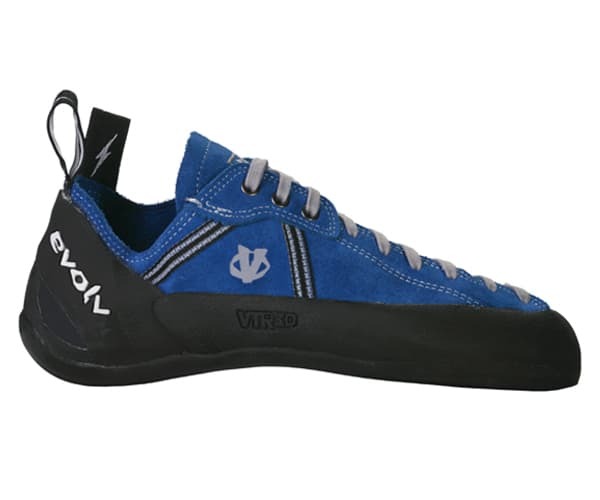 We recommend velcro shoes for gym climbing, sport climbing, and bouldering, but they're also good on multi-pitch climbs if you like airing your feet out on the belay ledge. Lace-up shoes are the most adjustable of climbing shoes and can give a climber a uniform, customisable fit. They can be a bit of a pain to take on and off, though, so they’re best for climbing days where you plan to put your shoes on and keep them on for a good, long while. 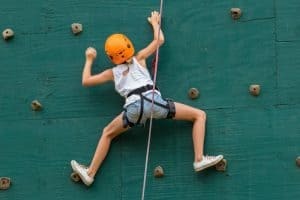 Now that you know what to look for in climbing shoes, let's move on to the reviews. We've picked a selection of our favourite climbing shoes to give you an idea of what's out there. 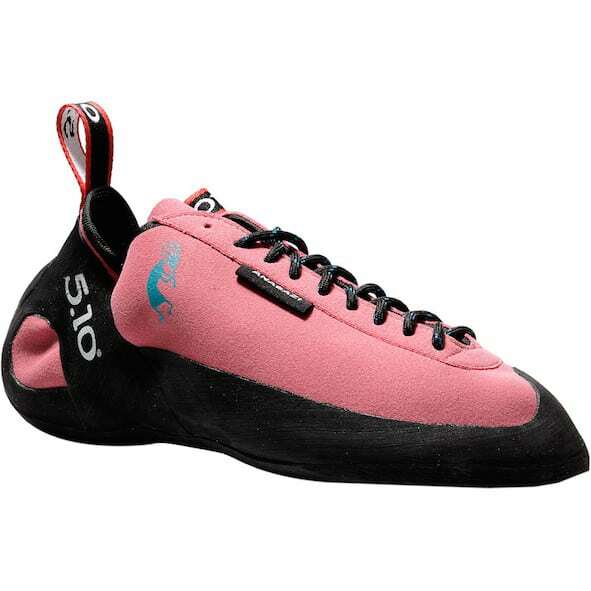 ​The Anasazi Pinks are one of FiveTen’s best all-around climbing shoes. With a neutral construction and a lace-up closure, they’re designed to fit well and be comfortable and without sacrificing performance. The Stealth C4 rubber from FiveTen is the best on the market and the medium-stiff midsole gives you the foot support you need after many long hours of climbing. The FiveTen last (i.e. fit) is normally a bit narrow, so these are best for people with narrow to regular feet who want a solid all-around climbing shoe. Designed for the master of climbing himself, Chris Sharma, the Evolv Sharmans are built for performance on high-angle terrain. Boulderers and sport climbers love the Sharman because of its aggressive downturn and toe knuckle protective rubber, which is handy for toe hooks. The Sharman’s synthetic upper doesn’t stretch, so it stays true to size and snug even after daily use. The high friction TRAX rubber is great for polished holds and steep sport routes, too. If you’re looking for a top-end aggressive shoe for difficult sport climbs and boulder problems, the Sharmans might be the shoes for you. ​A slightly less aggressive shoe than the Evolv Sharmans, the Scarpa Vapor Vs are a great moderately downturned shoe. 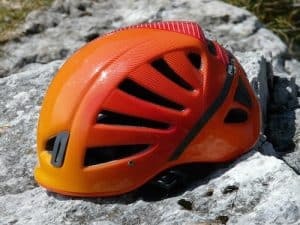 Such a design is ideal for climbers just starting to edge into the higher grades or for climbers who want performance yet aren't willing to sacrifice comfort. The Vapor Vs are made in Italy and are built for power and precision with their Vibram XS Edge outsole which offers unparalleled edging prowess. Instead of jamming toes into a small toe box, the Vapor Vs are designed to curve your foot downward for maximum power and comfort. 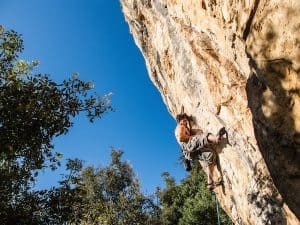 ​Black Diamond might be new to the climbing shoe game, but they’ve clearly done their research and testing with the Momentum. Their flagship neutral shoe, the Momentum combines comfort with performance for the novice to intermediate climber. The two-strap velcro, combined with a flat last design makes it perfect for daily use at the gym or crag. Plus, the upper fabric consists entirely of Black Diamond's proprietary knit textile which stretches, supports, and breathes for ultimate comfort. We recommend the momentum for entry-level climbers who prioritize comfort over everything else. If all that wasn't good enough, it's easy on the wallet, too. ​The Evolv Royale is a general, all-purpose shoe that combines comfort with value. It has a neutral profile and a comfy, yet snug lace-up closure. The Royales are an all-day shoe that don’t break the bank. Designed with a synthetic upper and TRAX high friction rubber, they’re a great first set of shoes for gym and outdoor climbers alike. They’re highly durable and are made for daily use. We recommend the Royales for new climbers on a budget. 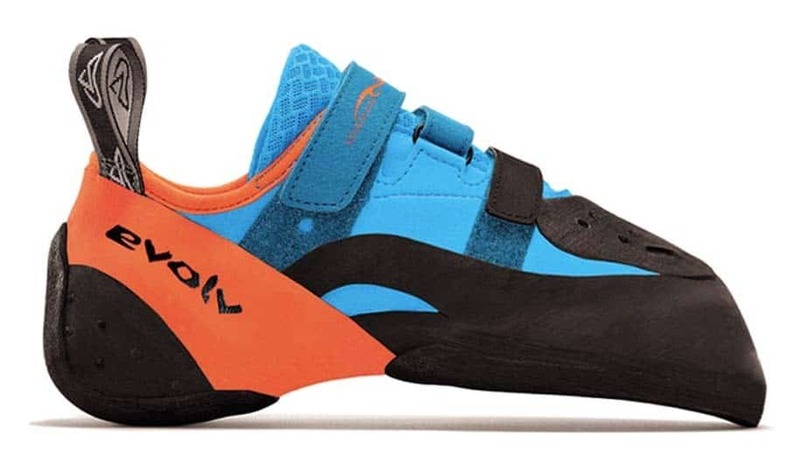 ​At the end of a climbing shoe review, there can be only one winner. We award the top prize to the FiveTen Anasazi Pinks for their all-around performance, comfort, and precision on a variety of routes. They’re made to last and to crank hard moves, so they’re perfect for daily use. Regardless of which shoes you choose, prioritise fit and shoe type when making your decisions. Happy climbing!